As I ponder whether and when to retire, I find my mind turning to the larger existential questions. This fact has taken me by surprise. Really, the decision to retire, at first blush, seems like not a big deal at all. A person works throughout life to earn a paycheque and and support herself and her family. Work, in every case, takes the most precious thing we have away from us – time. Some have argued that time is all we have in life, that life is time, and that when we are out of time our life ends. Straightforward, no? Therefore it makes perfect sense that as soon as there is no longer a financial necessity to work for that paycheque, a person should retire and take their time back. When I think of it this way, I want to retire right now. I want to paint those pictures, write those poems and novels, hike those trails, and travel to those interesting places. I want to do all of the things that I have been trying to fit into the little leftover corners of time that work and daily life affords me. And I want to spend more time with the people I care about – Rob, my friends, my kids and grandkids, and other family members. But wait a minute. I have worked very hard most of the years of my life, and I haven't done it just for the paycheque. Work has been an important part of my life. It has engaged me intellectually, creatively, and socially. Life isn't just time. It's also what one does with the time. In most ways, my work has been an integral and satisfying component of my life for all my adult years. It has been an interesting and important way for me to spend the time I have been granted, and also I have been able to contribute to my workplaces and to society in useful ways, which in itself is satisfying. When I think about it this way, I feel a great wave of fear. No, I can't retire! Not yet. Work is my life. Not all of my life, but a very big part of it. Am I really ready to walk away from it, this endeavour that has intrigued me, engaged me, and had me in its clutches since I was sixteen? But, I argue with myself, work doesn't have to be all or nothing. I have the good fortune to work in education, and to have the choice in my place of work to reduce to part-time or to transition gradually to retirement over a three year period. Also, in my workplace, I have quite a bit of choice over the types of work assignments I take. Theoretically, in a full-time role, I also have the choice to work long hours or more reasonable hours (but, being an A-type high achiever, so far I have never managed to cut back to the number of hours in most people’s normal work week, so I'm not holding out hope for a sudden self-transformation). Also, if I were to quit, I could take on contract work (if I missed my work too much), or carry on with my intellectual work independent of an employer and paycheque. Finally, I could take on volunteer work, or serve on boards or committees. I don't have to stay where I am, working full time, and feeling the obligation that comes with a full time job and a paycheque. Another interesting notion has occurred to me as I prepare to step down from my current role as administrator. As I begin to plan my transition out of the role and a move to a different smaller office, I wonder what I am going to do with all of the files I have accumulated during my four years in this job. There is an over-stuffed four-drawer filing cabinet, and most of a bookcase full of files that pertain to the position I am leaving. Then there are the thousands, or maybe hundreds of thousands of electronic files. Do I just pitch them? Will they be of any use to anyone? This is the material manifestation of the problem. But the real problem is that a great deal of the knowledge is in my head. As I walk out of the job, that knowledge goes with me. The new person, my replacement, will have to do their own learning, identify their own priorities, and invent their own way of working. Just like that, pfffffft, all that I have strived so hard to learn and do just disappears and becomes only a memory. And memories are ephemeral. I guess the exception to this is that those bits of my work that have been reified within a system, program, or someone else's practice or thinking will not be completely lost. There will be a small trace. This is also the problem of our lives. When we die, all that we have learned, all of our knowledge and skills, die with us. I hadn't really thought about this much before. It makes me wonder, why have I tried so hard to amass knowledge and to perfect skills? Just like material goods, we can't take it with us. And what's in our heads isn't even left for others. It all disappears. This Mother's Day weekend, I had the opportunity to do quite a bit of gardening. Every spring, I look forward to getting out into the vegetable garden to dig and plant. As I have written about before, I have two tiny patches in the backyard, one for berries, and one for veggies. The previous owners landscaped the yard with shrubs and perennials, but I have reclaimed these two spaces for my annual food growing activity. I use a square foot gardening method to maximize the productivity of the tiny garden. 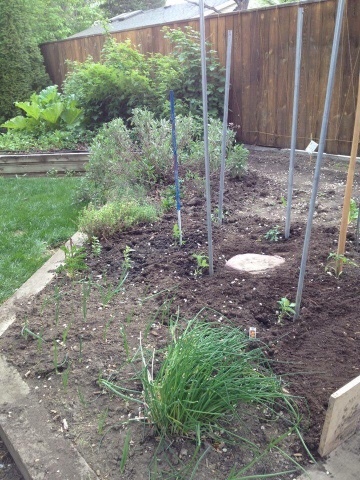 The photo below shows how the food garden looked after my efforts this weekend. In the foreground, there are chives and onions. This corner of the garden gets little sun, but the onion sets I put in about mid-April are thriving. Behind the chives are tomato transplants (the dependable Early Girl, and Lemon Boy, a new experiment). I have never, ever put my tomatoes in before June 1, anywhere that I have lived in Canada (except possibly when I had a greenhouse). I have also planted basil transplants and pole beans. This is very early to be planting tomatoes, beans and basil where I live, hardiness zone 4b. The rule of thumb here is to plant on the 24th of May weekend, and to expect frost on Labour Day. I also have planted from seed spinach and lettuce (mid-April), and carrots (today). In this photo you can see the herbs that have returned from last year: parsley, savoury, thyme, sage, and oregano. In the little triangular garden in the back against the fence, the raspberries, rhubarb, and strawberries are thriving. Because I have so little garden space, I plant potatoes in potato bags and set them around the patio. I have started the potatoes in their bags, but they are not visible in this photo. We also have flower beds. I have a perennial bed at the front of the house and also a raised bed that the annual flowers share with potentilla and spirea bushes. Yesterday, Rob and I filled it with wave petunias and a few transplants of some strange orchid-like flower I have never seen before. The natural soil here is heavy prairie clay. I compost, and use it to augment the soil. For the yard waste component of the compost, I am very careful to use only leaves and grass, etc., from our own yard. Many people here seem to use herbicides and neonicotinoids indiscriminately, whereas I garden organically. I also have purchased bags of sand, manure, and organic black soil most years. Gradually the soil in the food gardens has become deeper, looser, and richer. The flower gardens get short shrift, though, as by time I get around to thinking about augmenting the soil, it is too late -- the perennials are already up, and we have already planted the petunias. I might have stayed in the garden a little longer this afternoon, but the thunder was rolling overhead. The wind was roaring through the trees and blowing things around the yard. Now, an hour later, the wind is still blowing hard, but the thunderstorm seems to have passed over. A slight misty rain is falling, barely enough to dampen the ground. But 60 is different somehow. I was just in Vancouver, where I got together with a dear friend for an early birthday celebration. She turns 60 next week, and is not at all happy about it. I asked her why she was finding this birthday to be such a difficult one. She said, "because it means I am f*ing old!" I asked Rob, who turned sixty a few years ago, whether he had found it hard to turn sixty. He said, "no, not at all." The reason why, he explained, was that the collapse of his first marriage a number of years earlier created such a huge and traumatizing change in his life that a little thing like a particular birthday meant nothing in comparison. I also have had a traumatizing a life-altering experience in my past, but it hasn't softenened the big six-oh transition for me. Rob is a pretty mellow person, not given to hand-wringing and introspection. He lives each day as it comes along. That might be why he doesn't stress about birthdays. I think that the reason that 60 (and similarly 65) is difficult for many of us is that it marks a time of significant transition in our lives. For me, from age 25 to now, I have been focused on having and raising my kids, and on my career. Much else has taken a backseat to those two dominating priorities. Although it has not been a straight, smooth path, nevertheless my focus on these two things has been consistent. But now I am having to make significant decisions about my life path, and indeed, about the rest of my life. Suddenly, as I turn 60, I have discovered that my focus and priorities are changing. My youngest has graduated from university, and although he has lived with us for this past year, he is starting his first career-related job and soon things will be changing for him. I have made the decision to resign from my administrative role and to take up a different, less stressful and less time-intensive position at my place of work. As well, two months from now, I will be taking a lengthy leave before transitioning into that other role. This marks a significant change in my career "ladder-climbing." In essence, I have decided that I will not be pursuing further career progression. This represents a large attitudinal shift from my aims over the last 35 years. As I move toward stepping down from my role and the leave from work, my mind is turning to the next step, actual retirement. I am thinking about all the projects and life goals that I have been deferring for so long, because my work has dominated so much of my time and attention, not to mention also raising a family. When am I going to finish writing those novels, or really get into painting, if not soon? There isn't that much time left. Breaking my foot last Fall has made me realize that deferring some things for much longer may mean that they will never happen. For example, my foot, although healed, is still giving me a lot of pain. Does this mean that my days of backpacking and long hikes is over? Speaking of that, when am I going to go heliskiing, river rafting, and to Machu Pichu? Sixty is a wake up call. I have a friend whose long and successful career is coming to an end, not because she was ready to retire but because a reorganization of her workplace now has made retirement seem to be the most appealing option for her. I have another friend who just turned sixty who has sold her longtime business, has begun travelling to many interesting parts of the world, and has started writing a book. Yet another friend who is turning 60 has made the decision to resign from her part-time teaching position and is trying to decide when to step away from her clinical practice to begin full retirement. While I muse about retirement, time keeps marching on. My grandchildren are having birthdays, and I live far away from them. They will only be toddlers for a short time. Our friends are growing older, and some are losing their health, and some have died. Sixty is just a number. But in our decimal system based on ten, it marks a decade. The decade of one's sixties is the decade of the culmination of career, leaving the work world, and taking stock of life. In turning sixty, one enters the late stage of life, a chance to review what it means to have a good life, and a final chance to decide whether there are still some other components or tasks yet to be completed in our individual projects of making a meaningful life.